Gallia Academy senior Jacob Campbell (4) rumbles past a pair of Fairland defenders during the first half of Friday night’s Week 6 football game against Fairland at Memorial Field in Gallipolis, Ohio. GALLIPOLIS, Ohio — On the good side of this palindromic numeral. Jacob Campbell produced five rushing touchdowns before halftime, and the Gallia Academy football team churned out 492 yards of total offense on Friday night during an impressive 53-35 Homecoming victory over visiting Fairland in a Week 6 Ohio Valley Conference contest at Memorial Field in the Old French City. The Blue Devils (5-1, 3-0 OVC) trailed 7-0 less than four minutes into regulation, but the hosts rallied with 22 consecutive points and ultimately never looked back while building a lead as high as 26 points with eight-plus minutes left in regulation. 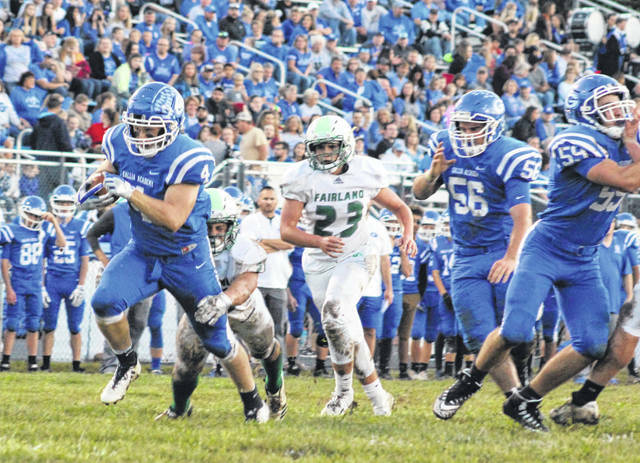 The Dragons (3-3, 1-2), however, continued to produce both offense and points as the night progressed, but the Green and White had little luck in slowing down the offensive juggernaut that Gallia Academy proved to be on this night. Besides an offensive explosion that included a season-high 357 rushing yards, the Blue Devil defense also finished the night with a pair of big first half takeaways — which eventually led to 14 points en route to a commanding 38-21 halftime advantage. The Blue and White also held Fairland scoreless in the third quarter while extending their lead out to 46-21 headed into the finale. Campbell — a senior who has slowly been working his way back into the offense after suffering a knee injury last season — appeared more than recovered by night’s end after producing 143 rushing yards on 21 carries, which included first half scores that covered 3, 27, 1, 6 and 5 yards. Gallia Academy also got 110 rushing yards from Justin McClelland on 20 carries, while Lane Pullins chipped in 95 rushing yards and a score on 19 attempts. Overall, the hosts ran the ball 65 times on their 79 offensive snaps — which led to an average of 5.5 yards per attempt. Fairland, conversely, mustered only 101 rushing yards on 18 tries … but also collected 299 yards through the air. Knowing that the Dragons’ offense had some firepower to it, GAHS coach Alex Penrod noted that the game plan was to run the ball, run the clock and control things at the point of attack. By night’s end, the second-year mentor felt that his troops more than accomplished the task at hand. And, in seeing the way his stable of running backs performed in this contest, Penrod believes that the next four weeks can be a really special thing for this program. More importantly, it was a great start to what should be an exciting Homecoming weekend at Gallia Academy. “Getting Jacob (Campbell) back to full strength just gives us a third dynamic option with an already solid one-two punch in McClelland and Pullins,” Penrod said. “The nice thing is that none of them care who scores or gets the most carries or produces the most yards. They only care that we are getting those touchdowns and winning football games. Gallia Academy was forced to punt on its opening possession of the game, giving Fairland the ball at its own 29 with 9:48 showing on the first quarter clock. The Dragons needed only one play and 11 seconds to take their only lead of the night as Michael Stitt took a handoff, ran straight up the middle and rumbled 71 yards untouched to the endzone — giving the guests a 7-0 edge with 9:37 showing in the first canto. Gallia Academy, however, answered with drives that covered 63 yards, 52 yards and 18 yards in a total of 20 plays, with Campbell capping all three drives with TD runs of 3 yards, 27 yards and 1 yard — allowing the hosts to turn a seven-point deficit into a comfortable 22-7 advantage after 12 minutes of play. FHS bounced back with a 4-play, 78-yard drive that ended with a 39-yard pass from Joel Lambiotte to Brennan West — allowing Fairland to close to within 22-14 just 16 seconds into the second frame. The Blue Devils, however, answered with an 8-play, 64-yard drive that Campbell ended with a 6-yard scamper at the 9:33 mark, making it a 30-14 contest. Fairland needed just 2:29 and eight plays to cover 78 yards for a score as Stitt hauled in a 20-yard pass from Lambiotte with 6:59 remaining until halftime, cutting the deficit down to 30-21. Campbell added his final TD run — this time from 5 yards out — with 25 seconds left in the half, giving the hosts a 38-21 advantage headed into the intermission. Both teams had 297 yards of total offense at the break, but the Blue Devils were also plus-2 in turnover differential over that same span. Trentin Waller recovered a fumble on Fairland’s third offensive possession of the first quarter, then Cory Call picked off an end zone pass on second-and-goal from the 13. Those turnovers eventually led to Campbell’s third and final scores of the game. 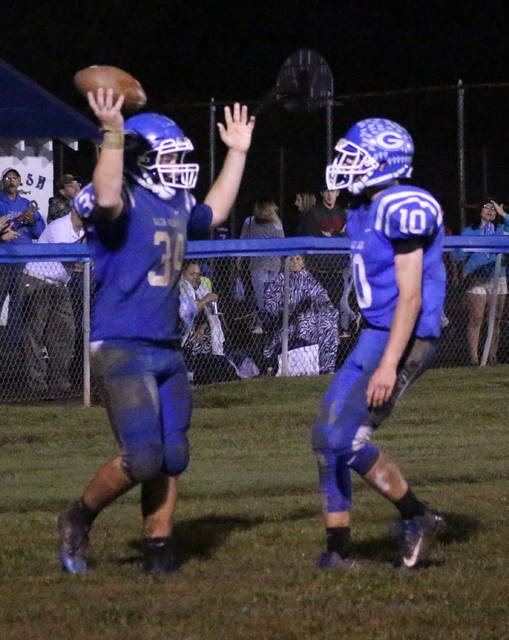 Gallia Academy’s Coen Duncan and Campbell each recorded sacks on Fairland’s opening drive of the second half, then the Blue Devils strung together a 20-play, 83-yard drive after getting the ball back. Cade Roberts hauled in a 14-yard pass from McClelland at the 1:16 mark of the third, allowing the hosts to take a 46-21 edge into the finale. Reilly Sowards hauled in a 11-yard pass from Lambiotte 50 seconds into the fourth to close the gap down to 46-27, but the Blue Devils answered with a 6-play, 57-yard drive that ended with a 4-yard run by Pullins at the 8:15 mark — making it a 53-27 contest. Lambiotte completed the scoring with a 9-yard run with 5:28 left in regulation. GAHS claimed a 26-17 edge in first downs and was also penalized seven times for 55 yards, while the guests were flagged five times for 35 yards. McClelland completed 11-of-14 passes for 135 yards, with Roberts hauling in five passes for 54 yards. James Armstrong also caught three passes for 56 yards. Stitt led the Dragons with 83 rushing yards on four attempts, while Lambiotte completed 18-of-27 passes for 299 yards to go along with three scores and a pick. West led the guests with five catches for 152 yards. Fairland completed passes to eight different receivers in the setback. 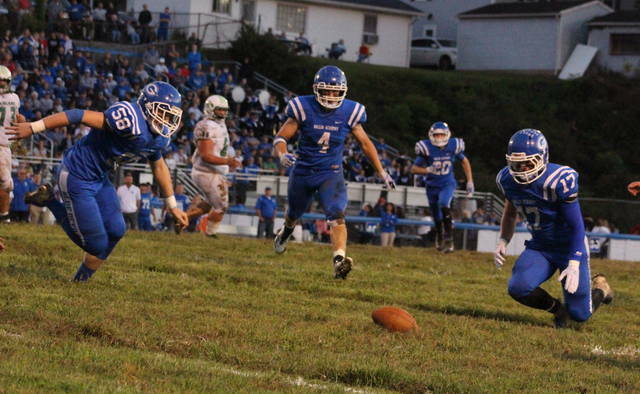 Gallia Academy returns to action Friday when it travels to Coal Grove for a pivotal Week 7 OVC clash at 7 p.m.